For weeks and weeks before Bridal Fashion Week each October, we speculate about what boho-vintage wedding gown goddess Claire Pettibone will do at her always-spectacular runway show. The themes of her collections are without exception creative, artistic, and entirely unique. This Bridal Fashion Week, Claire Pettibone wowed the audience, the fashion magazines and blogs yet again, this time with her Still Life collection. Says Claire of her inspiration for the collection, "In the second half of the 17th century, the art of the floral still life reached the height of fashion. Dramatic arrangements of flora and fauna, insects and fruits, set against dramatic dark backgrounds exude a mysterious romanticism. The brilliance of nature's beauty is highlighted to dramatic effect, just as the bride becomes the center of our attention. Painterly butterflies and floral details grace delicate silks and laces gilded in gold, glowing as if lit from within. Oh, the unexplainable mystery of love! Be still my heart...still in love...still life." Even the description leaves us breathless! 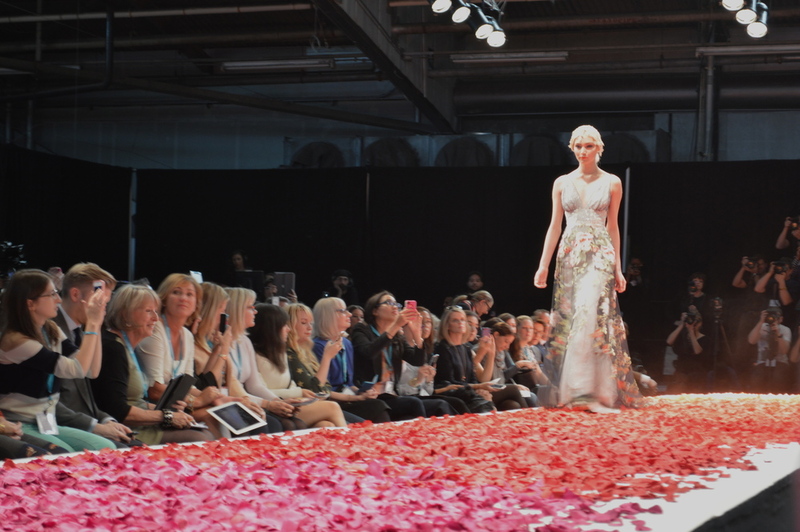 Then, imagine the delight we felt at walking in the show setting to see a long, elevated runway covered in silk rose petals arranged in a striking ombre color scheme, ranging from the palest blush to midnight black. No detail was spared for the setting of the runway show. Goodies for all guests included limited edition iPhone covers and notecards from Claire Pettibone's new collaboration with stationery brand Wedding Paper Divas. Decorations included opulent bouquets made of paper flowers and tags hanging from silk ribbon from each chair. To the applause of an awe-struck audience, Claire Pettibone took a well-deserved bow on the runway after the final walk-through of models. Bravo to Claire's Still Life collection! The excitement didn't stop there! After the show ended, we chatted with Bachelorette Des, who was in the audience with us. Did you know she used to work for a bridal accessories designer in Colorado?! To experience the incredible Still Life collection by Claire Pettibone and to meet and be styled by Claire Pettibone herself, join us for a trunk show at Little White Dress Bridal Shop, January 24-26, 2014! Mark your calendar now for our most popular trunk show of the year!